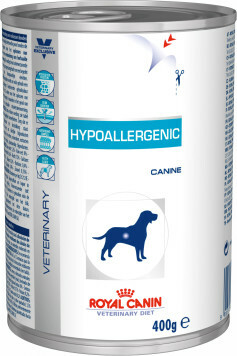 Hypoallergenic (can) For dogs with Adverse Food Reactions (AFR), food allergy, food intolerance, with dermatological and/or gastro-intestinal signs, food elimiation trial, Inflammatory Bowel Disease (IBD), Exocrine Pancreatic Insufficiency (EPI), chronic diarrhoea, small intestinal bacterial overgrowth (SIBO). 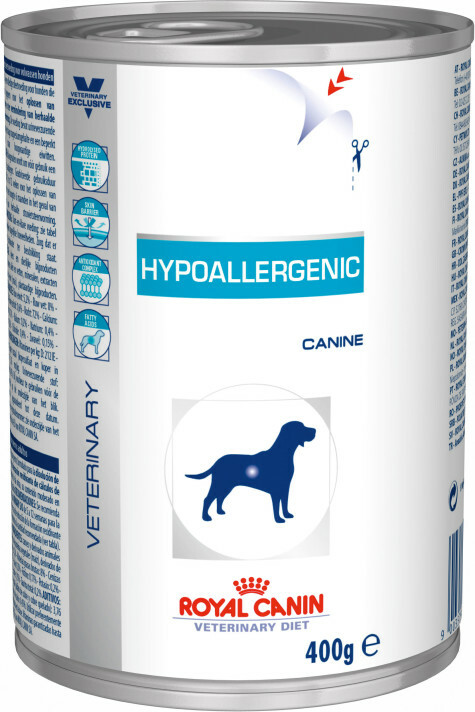 Soya protein hydrolysate, which is composed of low molecular weight pepties, is highly digestible and of very low allergenicity. Enriched with linoleic acid, EPA and DHA, essential and non-essential fatty acids known to modulate cutaneous reactions and help maintian skin health. Pea starch, soya protein hydrolysates, sunflower oil, cellulose, fish oil, minerals, hydrolysed chicken liver, lecithin, taurine, marigold meal (rich in lutein), trace elements (including chelated trace elements), vitamins. Crude ash: 6.3%. Crude fibre: 7.8%. Crude oil fats: 13.7%. Moisture: 74.5%. Protein: 23.5%. Vitamin A: 5000IU, Vitamin D3: 340IU, E1 (Iron): 25mg, E2 (Iodine): 2mg, E4 (Copper): 6mg, E5 (Manganese): 32 mg, E6 (Zinc): 120mg. Pentasodium triphosphate: 3g.